Following the successful opening of Holz Selection’s new showroom earlier this year in Hong Kong’s Wanchai’s district, the specialist timber retailer and distributor chose to highlight its range of Schotten & Hansen’s bespoke products. One of the highlights of the modern and minimalist showroom, designed by New Zealand architect Eqo Leung of Architecturepublic, is Schotten & Hansen ‘sound cube’, which pays homage to the luxury German brand’s values of heritage, craftsmanship, quality materials and attention to detail. Framed in black and featuring a perfectly square LED light feature which can be set to various colour tones, this fully functioning acoustic cube is an integral feature of the showroom’s design. It also functions as a meeting room and a space to showcase Schotten & Hansen’s range of products, which includes their highly distinctive wooden flooring, high-quality parquet, custom interior designs and various bespoke items including staircases, doors, tables and acoustic panel applications. “Schotten & Hansen’s products are made using natural hand-crafted timber, which is extremely popular in some of the most luxury residences around the world. Demand is growing is growing in Hong Kong and is becoming the obvious choice for residential properties at the mid to upper segment of the market,” notes Ewa Leung, owner and proprietor of Holz. “However, Schotten & Hansen’s timber is also being used in high traffic areas such as airports, hotels and commercial office spaces in Europe and the Middle East, for clients who are seeking a highly durable and luxury product,” she adds. Schotten & Hansen are renowned for their passion for the natural beauty of wood and their deep appreciation of working with the material. Indeed, the sound absorption characteristics of timber are well documented and the company has developed its range of acoustic-board products as an expression of this vision. With up to 300,000 holes per square metre, the hole patterns of Schotten & Hansen’s Acoustic-Board products are highly effective and fine in appearance. Consisting of B1-MDF board, a top/bottom step drilled hole of 12/8mm and a centre-to-centre grid of 16mm, the boards are manufactured with an acoustic fibrous web coating on the back and an oak veneer surface. With perforation MR 050250 V (or 0.05mm diameter), they are backfilled with mineral fibrous insulating boards of Akustic TP1, with a diametre of 40mm and an airspace of 50mm and 70mm cavity depth. Individual boards measure 2,500mm in length and 1,000mm in width, with a thickness of 17.2mm. Schotten & Hansen’s acoustic boards, wood surfaces and prefabricated lements were used extensively in the 47 apartments located above the breathtaking Herzog and de Meuron designed Elbphilharmonie concert hall in Hamburg, which officially opened its doors in January 2017. This award-winning project saw Schotten & Hansen construct over 1,000 prefabricated modules, which were delivered and assembled on site. The architects and Schotten & Hansen worked with star acoustician Yasuhisa Toyota, to develop a unique wall and ceiling structure. Known as the “White Skin” it features 10,000 individually shaped gypsum fibre panels cut with millimetre precision to reflect and optimise sound and acoustics. 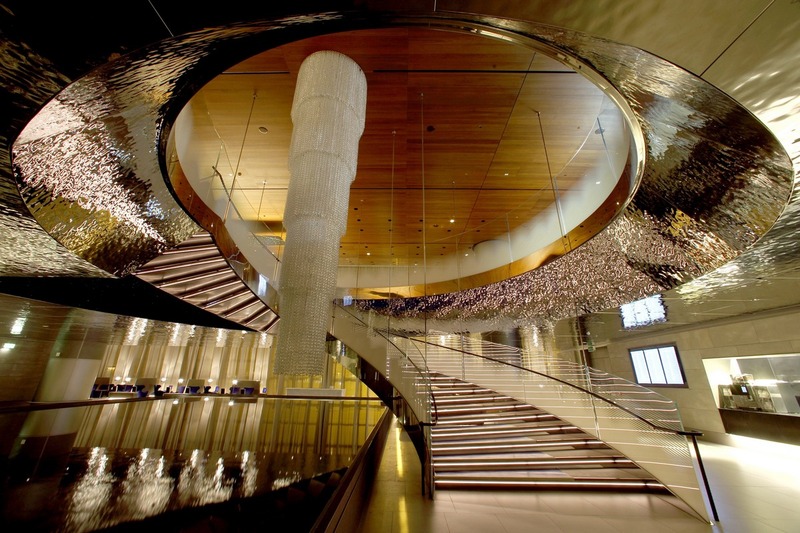 More recently Schotten & Hansen have worked with Italian architects Antonio Citterio and Patricia Viel (ACPV) on the Hamad International Airport in Doha, Qatar. 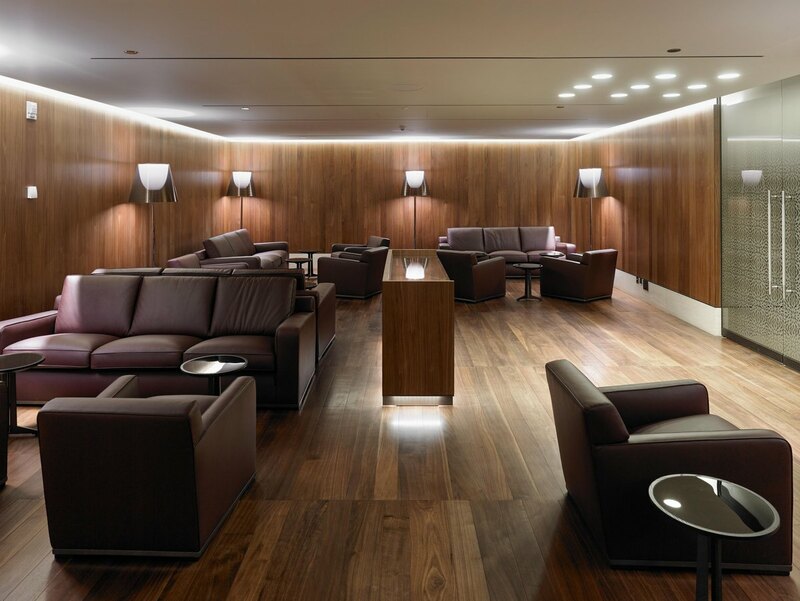 The collaboration included the design of the first class, VIP and business lounge interiors, and the check-in and waiting areas for Qatar Airways. The project saw the company produce 15,000 square metres of floorboards, acoustic wall elements and 500 custom doors, from product development through to material selection and on-site delivery and completion. For founder Torben Hansen, it was once again an opportunity to go the extra mile: “At Doha airport, we produced almost all of the interior elements in custom-made shapes and sizes. Fitting out the interior required precise and comprehensive project coordination. Our team laid out the raw materials and finished products – over 30,000 square metres of cut veneer in a 7,000 square metre space,” he explains. “The team were tasked with inspecting, sorting and approving every individual piece with the architects. Our team were able to bar code and prepare a comprehensive installation package on-site to ensure optimal and speedy assembly,” he adds. 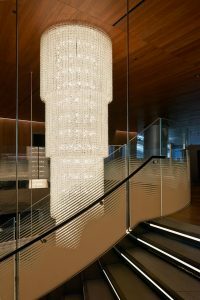 For Schotten & Hansen, it was a chance to show their commitment to a project that would allow them to display their attention to detail and focus on customer service. “This is closely linked to our commitment to partnership, and our willingness to develop products that bring the ideas of architects and designers to life. Working alongside them, we are able to open up completely new possibilities for architectural designs,” concludes Hansen.